This article includes a complete overview of each Iterable API type, how to use them, sample requests, and best practices. 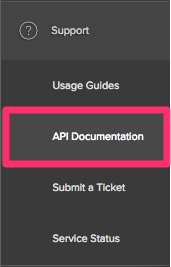 When submitting an API call, you can enter your API key either in the URI or in the headers. Where are Iterable's API docs? Where do I put my API key in the request? #Where is my API key? You can find your API key by navigating to Integrations > API Keys in Iterable's navigation menu. #Where are Iterable's API docs? You can add users into Iterable, update users, send events, access data, create campaigns, and much more with Iterable's APIs. You will see a list of our APIs with different functions. You can also send sample requests on this page. #Where do I put my API key in the request? The base URI is https://api.iterable.com. You can also place your API key in the header. The name of the header field for the API key is Api_Key or Api-Key. 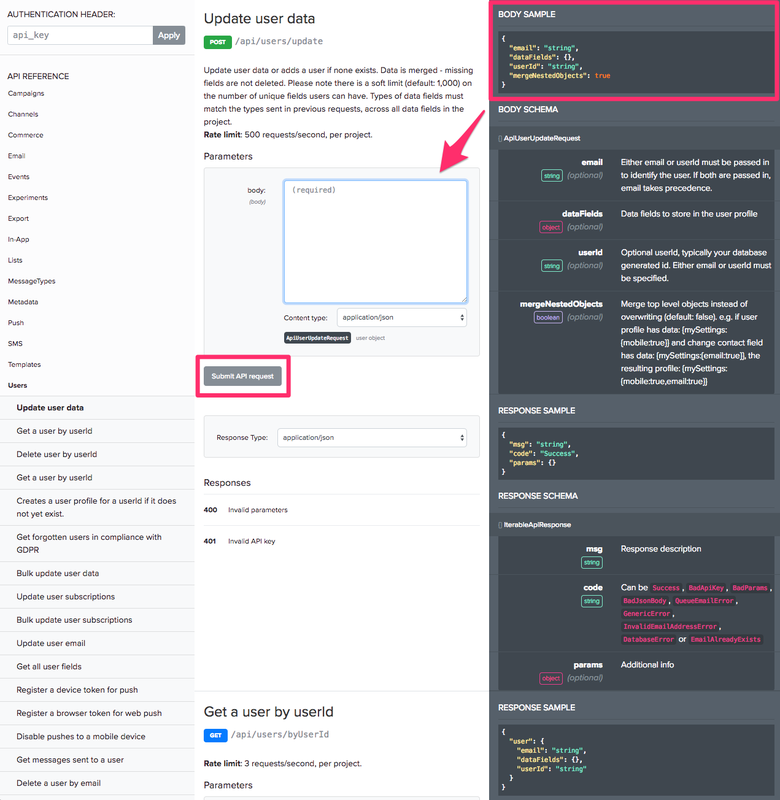 In our API docs, before entering your JSON payload, you'll need to authorize the API key in the Authentication Header section on the upper-left hand corner of the page. If you enter the JSON payload first, once you authorize the key, the JSON payload will be erased and need to be re-entered. This is used to add a subscriber to an existing static list. This is used to delete a list. All users who are part of the deleted list will have the list removed from their profile. This is used to remove one or more subscribers from an existing static list. This will return all the static lists in a project. Use this to create a new, empty, standard list with the specified name. Upon creation of the new list, it will return the list ID. Use this to receive events associated with a user profile. This will include custom events and standard Iterable events like sent an email, opened email, and clicked a link. The default value for limit is 30; if no override is set, the user's last 30 events will be returned. Use this to send custom events, such as user logins, signups, and app opens to Iterable. These events can then be used to trigger workflows or for custom conversion tracking in campaigns. Data fields in custom event calls can be used to populate merge parameters in templates. You can also segment on these events in the user profile. If createdAt field is not included, event will be sent immediately. Either email or userId must be passed in to identify the user. If both are passed in,email takes precedence. An optional string id parameter may be passed as one of the top-level parameters. If an event exists with that id, the event will be updated. If no id is specified, a new id will automatically be generated and returned. Tracks multiple custom events. Either email or userId is required for each event. Empty event names are not allowed. Events are created asynchronously and processed separately from the non-bulk event tracking endpoint. Thus, if you need to make sure events are tracked in order, send all of them to the same endpoint (either bulk or non-bulk). Rate limit: 10 requests/second, per project. There is a soft limit (default is 8,000) on the number of unique fields a custom event can have. Types of data fields must match the types sent in previous requests, across all data fields in the project (for the same event name). Bulk events are processed separately from regular event track endpoint. There's a 4MB limit for the request's JSON body (about 1000 events). Fields per event are the same as for single event in regular track event endpoint. Use this to track a mobile push notification open. Either email or userId must be passed in to identify the user. If both are passed in, email takes precedence. Include the campaignId in the call and it will attribute the open to the Iterable campaign that sent the notification. Learn more about Iterable push notifications here. Use this to track an in-app message click. Either email or userId must be passed in to identify the user. If both are passed in, email takes precedence. Learn more about Iterable in-app messages here. Either email or userId must be passed in to identify the user. If both are passed in,email takes precedence. Use this to track an in-app message open. Either email or userId must be passed in to identify the user. If both are passed in, email takes precedence. Learn more about Iterable in-app messages here. Updates one or more users' subscription preferences. 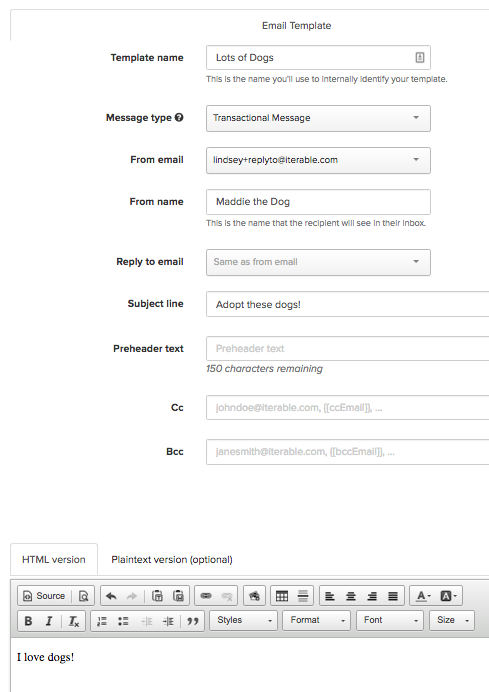 Include campaignId and/or templateId to attribute unsubscribes to campaigns and templates. Either email or userId is required. This endpoint will overwrite existing subscription preferences if fields are set and not null. Updates a user's email address. If the new email already exists in Iterable, an error will occur. All profile data and events will be migrated to the new email address. Either email or userId must be passed in to identify the user. If both are passed in, emailtakes precedence. Updates user profiles for one or more users. This endpoint is not recommended for time-sensitive user updates, as there may be a delay before the updates are completely processed due to the potentially high volume of these requests. There is also a limit of up to 4MB or roughly 1000 users per call. Changing emailListIds, unsubscribedChannelIds, messageTypeIds through this endpoint will not generate unsubscribe events. If any of the fields emailListIds, unsubscribedChannelIds and/or messageTypeIds are included for a given profile, then whatever is included in the array will be the preferences set for that profile, regardless of what the preferences were before that. If those fields are not included for a given profile, then no adjustments to preferences will be made for that profile. This endpoint will overwrite existing subscription preferences if fields are not passed in array. Either email or userId is required. To create a new user based on userId instead of email, pass in a userId and set preferUserId to true. Registers a mobile device token to enable push notifications. Either email or userId must be passed in to identify the user. If both are passed in,email takes precedence. Learn more about push here. Updates a user's subscription settings with new settings. This endpoint will overwrite existing subscription preferences if fields are set and not null. Either email or userId is required. Gets just the fields on users' profiles. This will completely wipe the user profile, including subscription settings and event history. If the user is re-added, the profile will be completely empty and will be subscribed to everything by default. Deleting a user will also remove them historic campaign metrics as well. Gets user's data fields and info. Delete a user using userId instead of email. This will completely wipe the user profile, including subscription settings and event history. If the user is re-added, the profile will be completely empty and will be subscribed to everything by default. Gets user's data fields and info. Uses userId instead of the user's email. 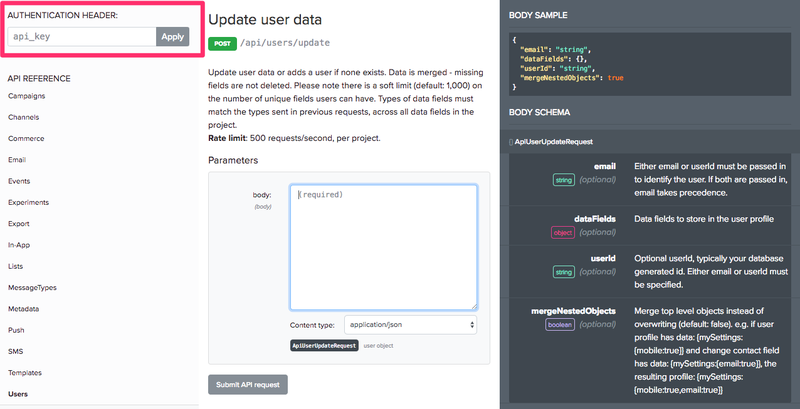 Updates a user profile with new data fields. Missing fields are not deleted and new data is merged. Returns a list of sent messages to a user within a certain time period. Includes the messageId, campaignId, templateId, and createdAt data. Does not include the body of the message. campaignId, excludeBlastCampaigns, startDateTime, and endDateTime are all optional. Disables device. Prevents it from receiving push notifications. Must include the device token. If the token exists on multiple user profiles, including email will disable the token for that one email address only. If email is not included, the token will be disabled from all user profiles. The same is true for including or not including 'userId'. Sends a triggered push notification to a specific user. Request data fields will override existing user profile data fields. Campaign must be set up in Iterable beforehand. If sendAt field is not included, message will be sent immediately. Get in-app mobile messages that should be displayed to a user. Sends in-app message to a specific user. Request data fields will override existing user profile data fields. Campaign must be set up in Iterable beforehand. If sendAt field is not included, message will be sent immediately. Get metrics for experiments(s). Note that we currently only export email experiment metrics. Sends SMS to a specific user. Request data fields will override existing user profile data fields. Campaign must be set up in Iterable beforehand. If sendAt field is not included, message will be sent immediately. Lists all message types for that project. Lists all channels for that project. Updates a specific SMS template. Most fields are optional. Include the fields you wish to update. Gets info for the templates in a project. Includes the templateId, creation and modification times, the name of the template, the creator of the template, and the message type used. Leaving templateType blank in the request will result in base templates only being returned. Updates a specific push template. Most fields are optional. Include the fields you wish to update. Get an email template's information and HTML. Creates a new template if one does not exist, or updates all templates with the specified client template id. Get an SMS template information and message string. Get a push template information and message string. Get an array of template ids that match a client template id. 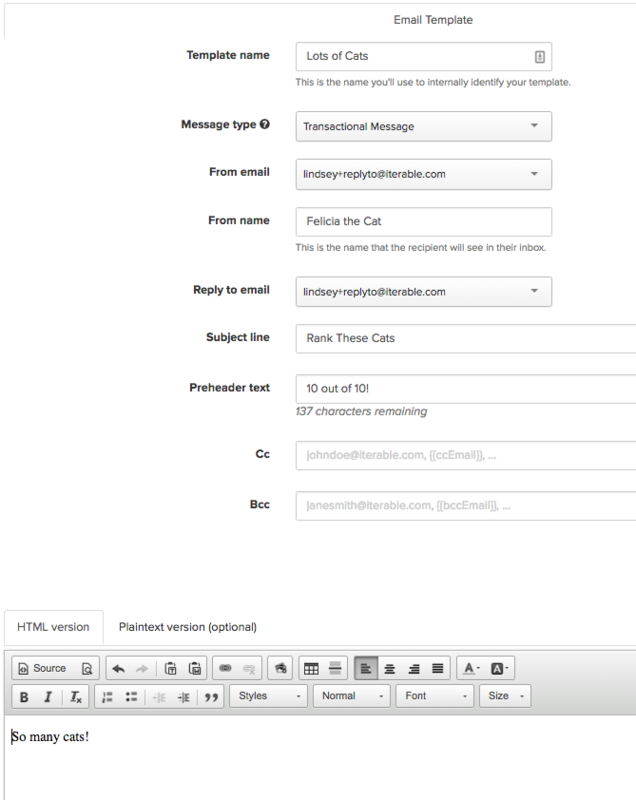 If the client has set a clientTemplateId on any email template(s), then this call will return those templates. Updates a specific email template. Only fields specified will be updated. This call will not work on templates made with the drag and drop editor. Creates and schedules a blast campaign up to two weeks in advance. The campaign will have a new template with a new template id. If the sendAt field is not included, message will be sent immediately. Gets info such as id, createdAt, name, templateId, etc. from campaigns. 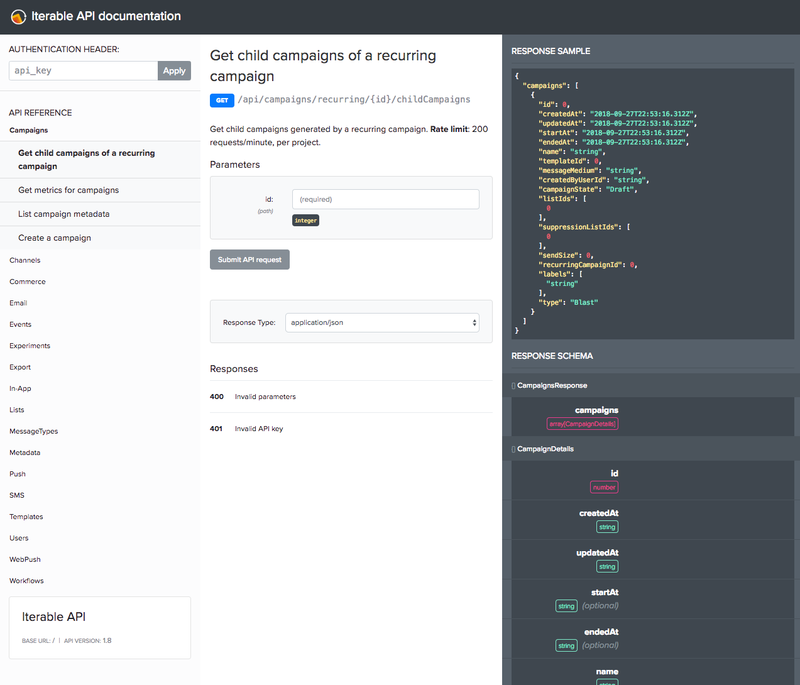 Get details for campaigns generated by a recurring campaign. Gets analytic info such as id, bounces, clicks, conversions, purchases, etc. from a campaign. A start and end date can be added to select the desired range of analytics. Updates shoppingCartItems field on the user profile. Fields in bold are required. We recommend casting the required price field as a double instead of a long. To do that, you will need to include a number with a decimal in the first call that you use to cast that field. Use a non-zero decimal value to cast the field as a double (example: 5.55). Otherwise, the field will be cast as a long. Tracks when a user makes a purchase. Also clears shoppingCartItems on the user profile. Adding in the campaignId will attribute the purchase to specific Iterable campaign. Fields in bold are required. As mentioned above, we recommend casting the required price and total fields as doubles instead of longs. To do that, you will need to include a number with a decimal in the first call that you use to cast that field.Use a non-zero decimal value to cast the field as a double (example: 5.55). Otherwise, the field will be cast as a long. Sends a triggered email campaign to specified email address. If sendAt field is not included, message will be sent immediately. This is an asynchronous call; a 200 response means that the request has been received, not that the email has been sent. View a copy of a previously sent email. Must include both a user's email address and the message id of the sent email. Exports different types of data (purchases, user created, email sends, email opens, etc.) in CSV format. 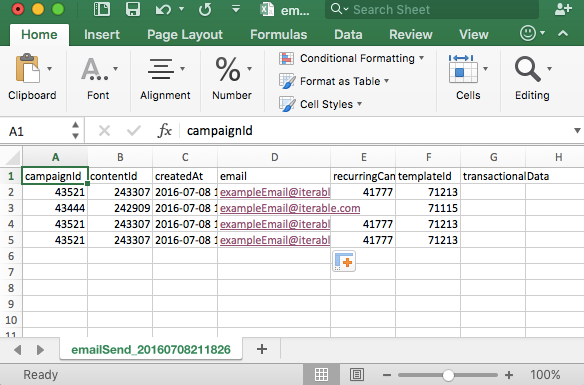 When the call is made, a string is returned as a .csv file. This file is then available for download. Exports different types of data (purchases, user created, email sends, email opens, etc) in JSON format. The range field will pull information based off of the profile update field. Triggers a workflow for a single user and/or all users on a list. Works for both standard and dynamic lists.